We are delighted to have completed the reconstruction of the memorial at Stobs Camp. Originally built by the German prisoners for their ‘Comrades who died far from home’ it had been destroyed in the 1960s but our intrepid team of volunteers, guided by Tree-ditions Craft School, have rebuilt it as close to the original as possible. 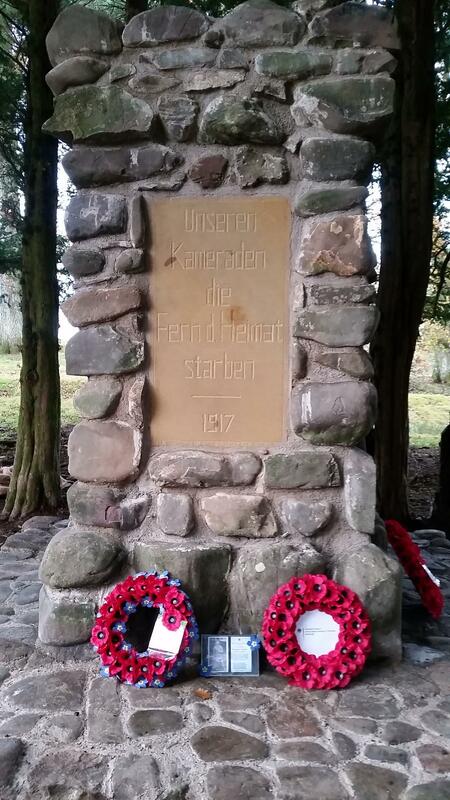 In a moving ceremony on 11 November 2018 it was formerly unveiled by Margaret Eliott, Deputy Lieutenant of Ettrick, Roxburgh & Lauderdale and Colonel Jean-Bernard Lacroix, Minister & Security Co-ordinator from the German Embassy in London. A blessing was led by Rev Michael Scouler, MBE and wreaths were laid. Music was provided by the Hawick Saxhorn Band and Ian Lowes unveiled a picture of Sebastian Bichler, a prisoner who died at Stobs in 1919. Thanks also to Hawick High School for running a poetry competition. The winning entry was read by a volunteer from Kelso High School. Huge thanks to Derick Thomson for the group photograph and to Dawn Berry of SEEit Productions for filming the event. Please listen to these moving speeches and congratulate our team on a job well done!